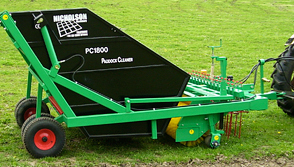 both the PC900 and the PC1800 set the highest standards for paddock cleaning. Remove debris from ground to allow light interception to the grass roots enhancing regrowth. Lift the droppings in grasses up to 20 cm high making it easy for the brush to work. Made from easily replaced segments and designed specifically for grass cleaning, the bristle size, shape and density are key features, blades of grass are wiped each side to cleanly remove the droppings. The Company does not guarantee all fungal and parasitic infections are removed but there will be a marked reduction with regular use. The patented part to the cleaner is the depth roller, this is a tubular roller fitted in front to protect the brush and ensures that once lifted droppings cannot fall back to the ground, depth wheels fitted each end accurately sense the depth in front of the brush. 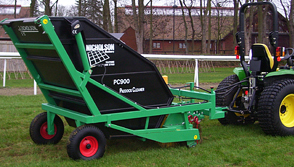 A good size hopper ensures emptying is kept to a minimum; the tipping height is 1.7 metres, to allow tipping over low trailers or building a high dung heap. Minimum tractor requirement for the PC900 is 17 hp. and the PC 1800 is 35 hp.